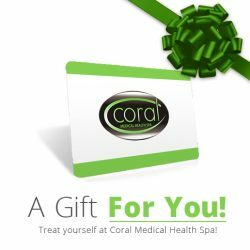 At Coral Medical Health Spa in Windsor, Ontario, we offer the latest in Laser Spider Vein Removal technology available today. Being the top medical cosmetic spa and leaders in Essex County, we strive to offer safe, effective and results based treatments to ensure that Spider Veins are removed quickly without danger to the surrounding tissue. We use the Apogee Elite Laser technology, specifically utilizing the ND:YAG Laser for Spider Vein Removal. Currently, the long-pulsed Nd:YAG laser is regarded as being as effective as sclerotherapy for the treatment of leg veins, and is the treatment of choice in patients who do not respond to sclerotherapy or who are “needle phobic”. Description of Spider and Reticular Veins: Spider veins are often found on the face and legs. The thin veins on the legs termed spider veins usually appear on the thighs and ankles. The veins on the face generally appear on the nose, chin or cheek area and often occur in rosacea. These veins are purple, blue or red and usually appear in three basic shapes: linear, branch-like or spider-shaped, with a dark center point. The Nd:YAG laser light used at Coral Medical Health Spa penetrates deeply into tissue and can be used for the coagulation of unwanted veins. It may take several weeks after the laser treatment to notice improvement and often additional vein treatments are required. Pricing: $139-$189 per treatment depending on the time required and area treated. To determine exact pricing please contact guest services to schedule a FREE consultation.